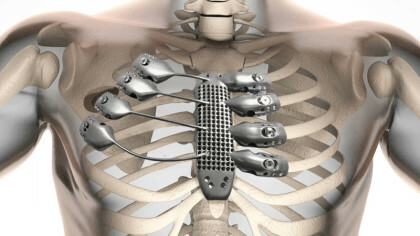 In a rare surgery and first of its kind in the world, a Spanish cancer patients has become the first receiver of a 3D printed titanium sternum and rib implant. Suffering from a chest wall sarcoma (a type of tumour that grows in and around the rib cage), the 54-year-old man needed his sternum and a portion of his rib cage replaced. He is now reported to recover well after the unique surgery. Melbourne-based medical device company Anatomics, who designed and manufactured the implant utilizing Commonwealth Scientific and Industrial Research Organisation, Lab 22 is a part of the rare health programme.